Our framework allows us to customize the process of building, marketing, and maintaining your online marketing efforts to best fit your needs. Our process lies in building an outstanding relationship with you throughout the four main phases of an engagement. During the discovery phase an Account Manager meets with your and your team to help you assess your needs through a thorough understanding of your goals and objectives both for your Internet endeavors, but more importantly as they relate to your marketing objectives overall. Additionally, we focus on your target audiences and your objectives for them while they visit your Web site. In this phase we use a variety of interview tools to create a high-level site map. In addition to a dedicated Account Manager, a Project Manager will be assigned to your project as we move into pricing. By having a Project Manager involved early in the process we are able to provide you with accurate estimates and timelines. 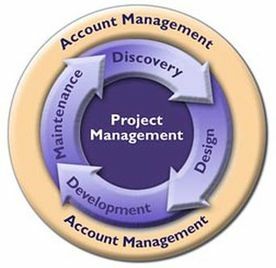 To learn more about our project management methodology, click here. At the end of the discovery phase we provide you with a complete proposal based on the information gathered. During the design phase our team works with you to create a look and style for your site that portrays who you are and attracts your target audience. We begin with a kick-off meeting where the Account Manager, Project Manager and the Lead Designer on your project will meet with your team and administering and reviewing the design questionnaire. As the Designer creates samples based on your input and works with developers to create these samples or design comps for your approval. Once the comps are completed, any functionality that the site will include is modeled for review by you and the development team. This creates a clear understanding of what your site will look like and what it will do prior to beginning the development phase. When the comps are approved we are able to begin the actual programming tasks and building out the pages and links. The iterative nature of this step insures that you get all of the functionality that you want in your site. At this time any necessary databases and applications are configured. Prior to completing this phase we perform all testing and a final quality assurance review. The development phase is completewhen we go live with your site. Our process does not end once your site is published. We are able to perform ongoing maintenance, including updates to your site because of design changes, or modifications to take advantage of time sensitive offers or the latest news from your company. Our phases provide the foundation to develop a program that is as fully realized as you need it to be.